When importing your runs, Progenesis may encounter problems with the data that can affect your analysis. Some of these problems are more severe than others, but how do you judge whether they're severe enough to warrant removing the run from the experiment? There are 3 possible results when importing a run; these can be seen in the list of runs at the left of the Import Data screen, when the Import details view is selected (show me). The data in the run could not be imported at all. You can safely remove the run from the experiment, as it cannot contribute further to your analysis. Runs imported with warnings may still be usable for analysis. If you decide to keep these runs, you should still review their chromatography (see below). Runs that have been imported successfully should still be reviewed for chromatography problems; the successful import simply means the file has the expected format. 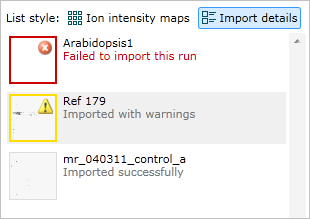 Even when a run passes all of the automatic QC checks during import, it is still recommended to review its ion intensity map. There may be more subtle problems with its chromatography that are more easily spotted by eye.